It’s a pretty far-fetched idea, and almost certainly not true, but the idea of life on Earth originating from somewhere else is not as completely ridiculous as it might seem. The idea is called ‘panspermia,’ and while there’s not a whole lot of evidence supporting it, it’s also not impossible. You might have a black thumb when it comes to earthly seeds, but cosmic seeds grow big and black, making supermassive black holes. Using data from NASA’s Great Observatories, astronomers have found the best evidence yet for cosmic seeds in the early universe that should grow into supermassive black holes. Most people are familiar with the astronomical term “black hole,” but don’t really know what it means. For those that do, there’s some interesting findings soon to be published. Researchers combined data from NASA’s Chandra X-ray Observatory, Hubble Space Telescope, and Spitzer Space Telescope to identify these possible black hole seeds. They discuss their findings in a paper (“First Identification of Direct Collapse Black Hole Candidates in the Early Universe in CANDELS/GOODS-S”) that will appear in an upcoming issue of the Monthly Notices of the Royal Astronomical Society. What are the current thoughts? Scientists believe a supermassive black hole lies in the center of nearly all large galaxies, including our own Milky Way. 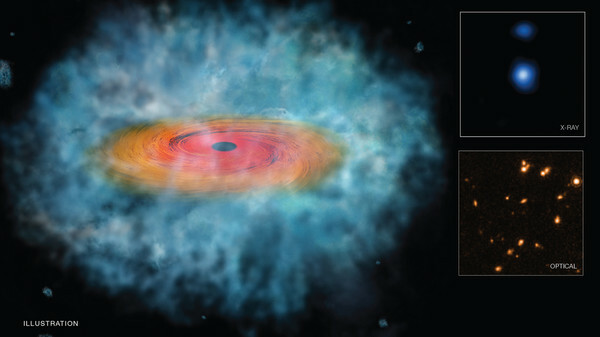 They have found that some of these supermassive black holes, which contain millions or even billions of times the mass of the sun, formed less than a billion years after the start of the universe in the Big Bang. Interstellar grains seen by the Cassini spacecraft lend support to the old panspermia hypothesis. After analyzing ten years of data from the Cassini spacecraft that’s been orbiting Saturn since 2004, a team of scientists led by Nicolas Altobelli of the European Space Agency in Madrid, Spain, reports finding dust that came from outside our solar system. Along with millions of ice-rich dust particles shed by Saturn’s moons, Cassini’s Cosmic Dust Analyzer detected a grand total of 36 grains that the scientists could trace back to the local interstellar cloud. That cloud is an almost empty bubble of gas through which our solar system is currently moving. The small interstellar dust grains were zipping past Saturn at speeds of over 72,000 kilometers per hour (44,000 mph), which explains how they avoided becoming gravitationally trapped by the sun. This marks the first time scientists have been able to analyze material from outside our solar system. Intriguingly, the Cassini Cosmic Dust Analyzer saw the same kind of chemical and mineralogical make-up in the interstellar grains as it did in the local dust.